Today, two by-elections were held in the cities of San Cristóbal and San Diego. In both cities, the opposition mayors – elected a few months ago by huge margins – were indicted and jailed in quickie trials for allegedly not doing enough to stem opposition protests. The MUD coalition quickly decided that the candidates for both posts would be the wives of the jailed mayors. 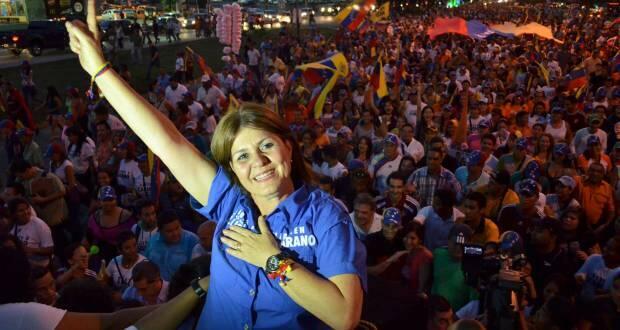 In San Diego, a suburb of Valencia, Venezuela’s third-largest city, Rosa de Scarano won with 87% of the vote. A few months ago, her husband had won with 75% of the vote, so Mrs. Scarano improved on her husband’s performance by quite a bit. In San Cristóbal, the birthplace and epicenter of the protests, Patricia de Ceballos won with 73% of the vote. In December, her husband won with 67% of the vote, so she too built on her husband’s triumph. The results are a resounding victory for the faction inside the MUD who wants to continue participating, in spite of the deck being stacked against us. It is a heavy defeat for chavismo. It shows that the government continues losing support, unable to muster its forces even when faced with political neophytes and an opposition that is both financially and physically exhausted. If they were counting on political infighting within the opposition to keep their voters home, they were mistaken. It is also a defeat for guarimberos, the faction of the opposition that sees “the street” as the only way to fight the government. San Cristóbal may be the hotbed of protests and barricades, but its citizens went out to vote (participation in both places was above 50%). If these people think that there is no point in voting, that the electoral solution to Venezuela’s crisis is completely closed, then these results should at least force them to polish their arguments. Finally, it is a defeat for naysayers, for people who argue that protests work against the opposition by making us lose popularity. Both Ceballos and Scarano were seen as leaders of the protest movement, if not enablers of the barricades. The voters came out and supported them strongly – more than when they were originally elected. Whatever ill feeling there may be between opposition voters and some of the leaders of #LaSalida, it didn’t show in this election. Obviously, local issues permeate this election, so one should be careful not to read too much into these results. In spite of that, the victory is a hugely symbolic one.